Results of expedition studies of the spatiotemporal variations in the aerosol optical depth (AOD) of the atmosphere during the 42nd cruise of research vessel (RV) “Akademik Boris Petrov” (January 18–March 28, 2017) along the route from Singapore to Kaliningrad (via the Suez Canal) are discussed. It is shown that the highest atmospheric turbidities were observed over the Arabian (due to the outflows of finemode aerosol from Hindustan) and Red (due to the outflows of dust aerosol) Seas, where the average AODs near 0.50 μm was 0.355 and 0.304, respectively. A considerable aerosol turbidity is also a characteristic of the atmosphere in the Strait of Malacca, burdened by aerosol outflows from the direction of Sumatra and western Malaysia (average AOD is 0.262). Different aerosol contents are noted in the neighboring equatorial regions of the Indian Ocean: the AOD in the middle of the ocean, more remote from the contents, was a factor of 1.5–2.0 larger than near Sumatra Island. 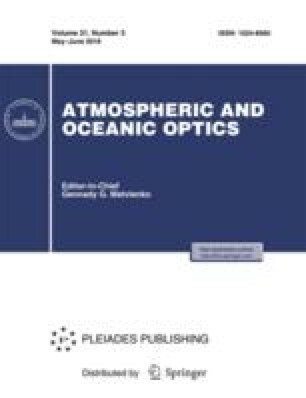 All the tropical zone of the Indian Ocean is characterized by high values of the Ångström selectivity exponent (1.08–1.18), indicating a predominant contribution of fine-mode aerosol to the AOD. Original Russian Text © S.M. Sakerin, D.M. Kabanov, 2018, published in Optika Atmosfery i Okeana.